Is there anything new that is being written about Muhammad Ali following his passage on Friday last week? Certainly not for people who are old enough and who know everything about Ali's extraordinary life story as a boxer of boxers. But for the kids who are growing up, there are some aspects of Ali's life story that will be new to them. But one line in Ali's life story that is attractive and that must be attractive to both old and young, is the reminder that every man would be remembered for his deeds. Since Friday, the stories about Ali had been how he was born not with a silver spoon, but just like any struggling person, and how he struggled his way up the ladder of success, confirming Shakespeare's words that it is possible to achieve greatness, and that not who are great has greatness thrust upon them or has been born great. Again, there has been no report about the number of cars and mansions he acquired or his number of wives and children, but how he demonstrated fearlessness, naturally given guts, and how he achieved greatness, risking the many jabs to his body and careless of the risks involved to his health. Apparently, it is one of his quotations in which he said that no man who avoids risks can achieve greatness. Ali was not only great in life, he is also great in death, as his story line shows. He looked at life, not as an adventure, but a certainty, against a quotation openly displayed at one optic's store in Downtown Manhattan, which says that life is not certainty, but an adventure. Whether life is certainty or an adventure is debatable. But the truth is that Ali's life shows that life can be a certainty, depending on experience and how it is individually approached. 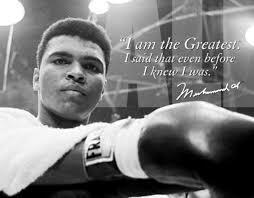 Is it any wonder that Ali has proclaimed himself as the greatest? Would not any man who has gone through his type of experience say he is the greatest like Daniel, Shadrach and Abednego, who all went through Nebuchadnezzar's fire unscathed? ​ Ali's life experience is equivalent of fire experience. So many instance capable of creating setbacks, but nonetheless pushed forward against dangers. Many people agree that achievers like Ali don't die, but transforms from mortality to immortality, because their valiant deeds will live after them.